Can Obama turn the 'reset' into 'perestroika'? 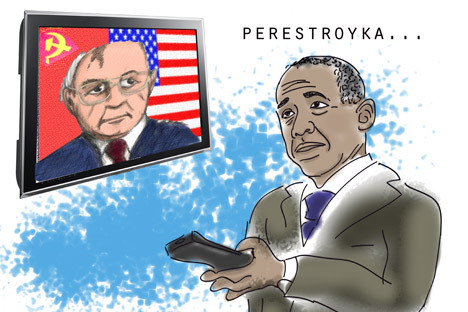 Political analyst Boris Mezhuyev draws astute analogies between Barack Obama and Mikhail Gorbachev, suggesting that a weakened Washington is now offering its hand to Moscow, as Gorbachev’s regime did with Reagan under perestroika. Drawing on the outcome of perestroika, Mezhuyev concludes that it would benefit Russia to put distrust aside and take Washington’s hand. The 44th president of the United States, Barack Obama, recently delivered his annual State of the Union address to Congress. For the first time, he did not sound like a peace-maker or the architect of endless compromises. He sounded like a consistent liberal and a staunch opponent of the Republican conservative majority. Will Russia be Obama's foreign-policy priority? In his speech, President Obama called for higher taxes, insisted that important social programs be upheld and called for stricter gun control. Finally, and most importantly, he promised to withdraw troops from Afghanistan in 2014, thus drawing a line under the 12-year war against global terrorism. Obama did not say that al-Qaeda or any other organization with similar goals no longer threatens the U.S., however. The president simply made it clear that the U.S. no longer needs to invade any country to ward off the terrorist threat. Obama also seemingly hinted toward the fact that any pressure exerted on the Syrian regime will be exclusively diplomatic in nature. Thus, he suggested that interference in the Libyan civil war on the side of the rebels should not be considered a precedent for a similar resolution of the Syrian situation. It seems that Obama has gone a step too far, isolating the neoconservatives and imperialists at home, as well as those who were hoping for outside help from the United States. It may have something to do with the Nobel Peace Prize he was awarded for his future work. On the other hand, it may be that he is guided by his own personal beliefs. In any case, it looks as if Obama is beginning to justify the title of “America’s Gorbachev” — a title that, for some reason, stopped being used, and just when genuine grounds for such a comparison have appeared. The analogies are indeed striking. Gorbachev withdrew troops from Afghanistan in his fifth year in power. Obama is going to do the same, five years after his first inauguration. Gorbachev called for a reduction of nuclear capacity, making several unilateral concessions to the United States. Obama, of course, is not making any such concessions; then again, he has not been allowed to. Still, he continues (and even initiates) dialogue with Moscow on arms control, which is admittedly very difficult for him. Obama is not exactly enamored with Putin, just as Gorbachev was not particularly fond of Reagan. Reagan wanted to see Gorbachev not as a secular Marxist but as a deeply religious man at his core. It may be that, for Putin, Obama is too liberal — that is, too secular. He may also have many reasons to be wary of Obama and to suspect that his “reset” (which looks increasingly like our “perestroika”) is some kind of ploy. This was more or less how the Republicans surrounding Reagan initially saw Gorbachev. As American political journalist James Mann writes in his remarkable study, “The Rebellion of Ronald Reagan,” all the gurus of so-called realism (Kissinger, Nixon and Gen. Scowcroft), and everyone who easily found common ground with the conservative Brezhnev, urged Reagan to be careful with the young and popular Gorbachev. The advice was not to engage him in far-reaching negotiations, let alone succumb to the sinister charm of the liberal Gorbachev. Reagan brushed aside all of these warnings and made a revolution in his own entourage, affecting a rapprochement with Gorbachev’s Soviet Union and eventually winning the Cold War. Today, Putin is being advised from all sides to be wary of any sinister provocations by a “retreating” Obama. The suggestion is that the “retreat” is a clever and perfidious ploy which, if Putin plays into, will instantly bring about a collapse of Russia and see the Bolotnaya opposition rise to power. We were so afraid of a repeat of perestroika at home that we did not believe it when it started on the other side of the Atlantic; and it came about for the very same reasons it happened in the Soviet Union. That is, it happened because of overreaching imperial ambitions — the need to reduce military commitments to solve current economic and social problems. Today, Russia’s leader has an excellent chance to play the role of a “Russian Reagan” by not pushing away the proffered hand of a slightly weakened partner that does not mind admitting its own weaknesses and ailments. If one gives free reign to the imagination, we should drown the U.S. president in an atmosphere of universal love for him, if only to make him more benevolent toward our country and more sensitive to its interests. Boris Mezhuyev is a political columnist for Izvestia newspaper. This opinion is first published in Russian in Izvestia.